This nice, neat, small credit Card Wallet is perfect for every day use. 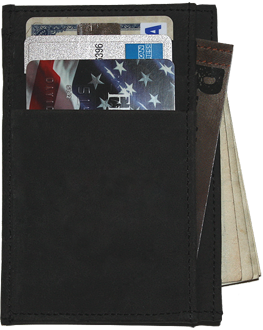 Its minimalist design holds your license, credit cards, cash, and business cards... what else do you need? 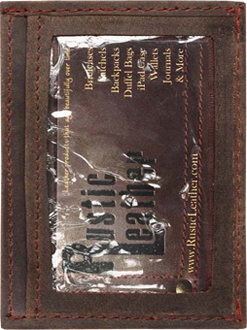 So why carry a big, fat wallet in your back pocket that will eventually give you back problems when you can carry this elegantly simple wallet. It fits nicely in your front pocket without being bulky to elude pickpockets. 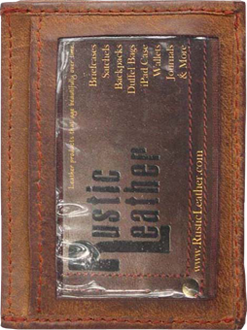 This wallet works great with our Shoulder Pouch and tucks neatly inside. 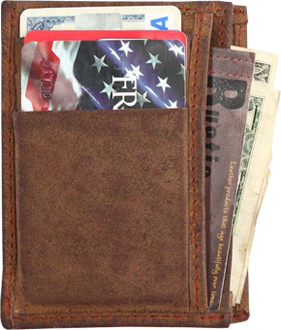 This little card wallet will stand the test of time. The Buckskin Tan Wallet on the left is my personal wallet which has been in my pockets for 2 years now... and it looks GREAT!